Hey Friends! It's Wednesday... Humpday. Whew! I don't know about y'all, but this week is kicking my "you know what." I guess I got spoiled during the Holidays, but I am really ready for the weekend to be here. 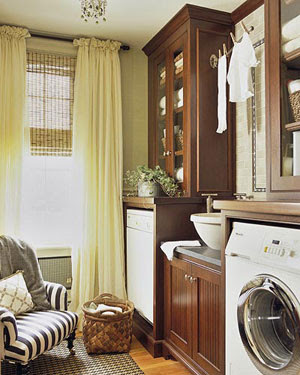 Here is what the laundry closet consists of: ugly louvered doors, old washing machine, oldER dryer, and a wire shelf. THAT'S IT. While I am thankful for working machines, I really wish that I had front loaders, cabinets, and maybe a sink. Hey - a girl can dream right? 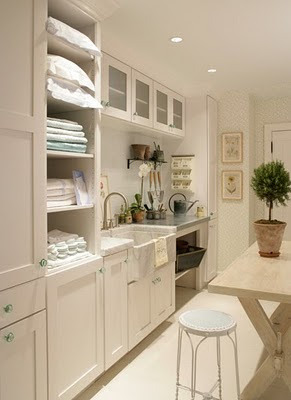 Hubs says in our next house, we can have a mud room/laundry room. That day can't come fast enough. Below are some examples of what I would love to have. The next house is a few years in the future - but I can keep wishing, right? In the mean time, maybe I will paint the inside of my laundry closet, change out the doors and change out the wire shelf. I'll keep you updated. Hope you guys have a great rest of the week! Talk soon, friends! I'm with you on the real laundry room. I, too, have only a laundry closet in the kitchen. 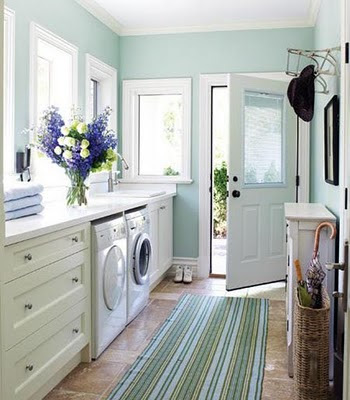 I do, however; have front loaders and my doors are a nice oak bifold, but I am so jealous of people who have a real laundry room that they can decorate and do other things in, like maybe crafting. Oh, well, here's to hoping for a new house. i LOVE that 1st pic!! PS Excited to follow you!